Why I Love You I love you for so many reasons, Big and small. But all of them are wonderful. I love you for all the special qualities, That makes you one of a kind, The only one in the world for me I love you for all the things you do, That brings such special meanings to my life. I love you for the silent times, When your eyes and arms tell me all I want to know. 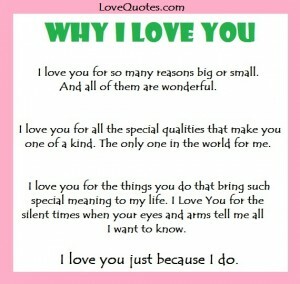 I love you, Just because I do. Because now, In the deepest part of my heart, A place where there was nothing before, There is love.